When Chris’ wife leaves him, he has no job, no home and a five-year-old son to care for. Their salvation may lie in an unpaid internship at a prestigious brokerage firm where Chris hopes to secure a job at the end of six months, but meanwhile the pair must survive by living in homeless shelters. Chris pushes himself to the breaking point trying to create a better life, all the while focusing on nurturing his son and keeping him from knowing the direness of their situation. Admission to Movie Night is free thanks to the generosity of supporters like you. Complimentary popcorn and beverages will be served. 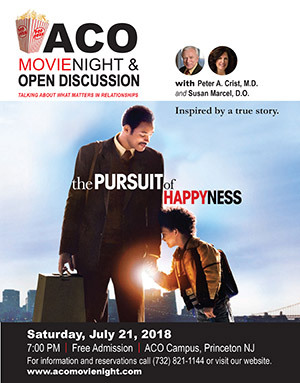 For reservations call (732) 821-1144, email aco@orgonomy.org or reserve on-line.